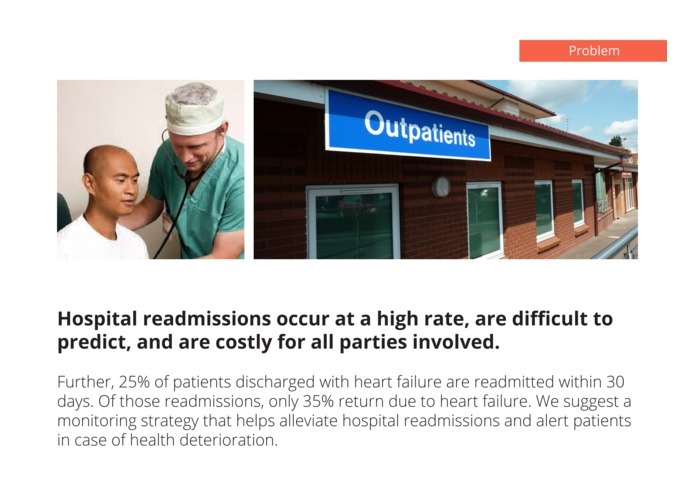 Heart failure costs an estimated $30.7 billion annually, with more than 25% of patients readmitted within 30 days. In order to decrease the risk of readmittance, we enable family and friends to keep an eye on their loved ones by monitoring their health status and alerting them of changes. 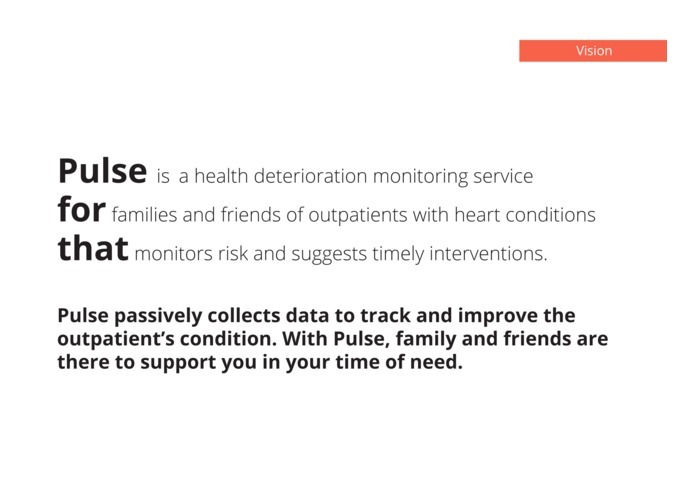 Pulse is a health deterioration monitoring service for families and friends of outpatients with heart conditions that monitors risk and suggests timely interventions. 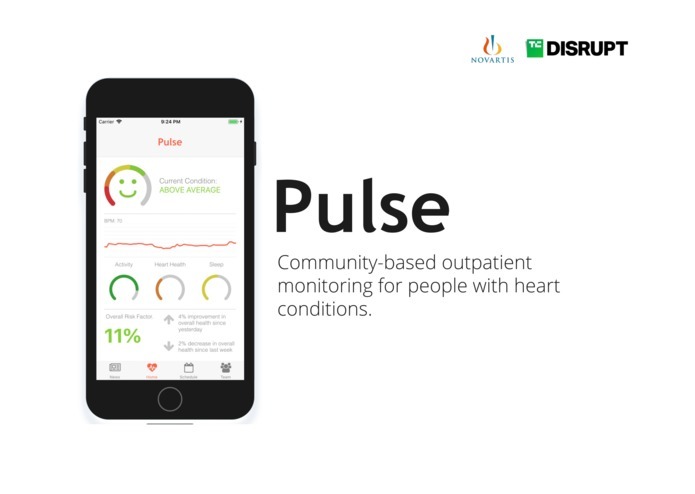 Pulse passively collects data to track and improve the outpatient’s condition. With Pulse, family and friends are there to support you in your time of need. 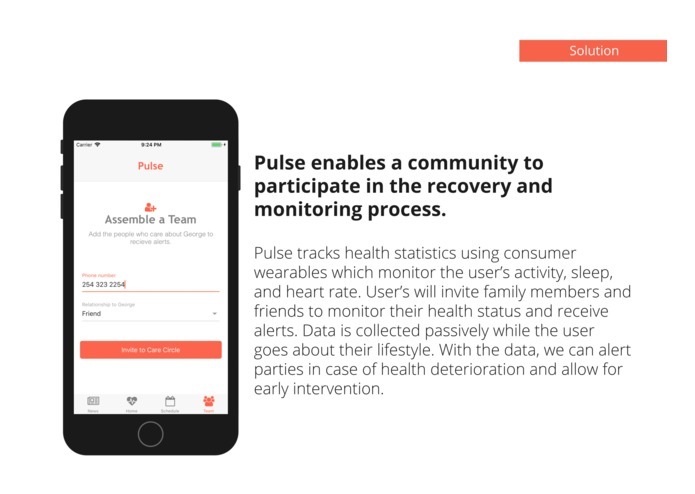 Pulse enables a community to participate in the recovery and monitoring process. 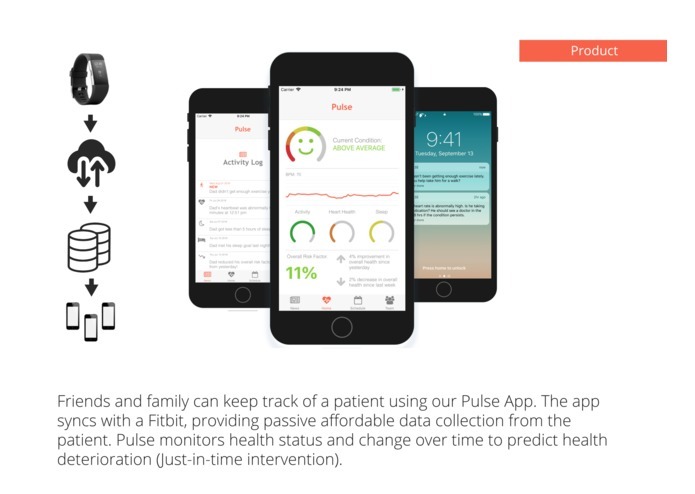 Pulse tracks health statistics using consumer wearables which monitor the user’s activity, sleep, and heart rate. 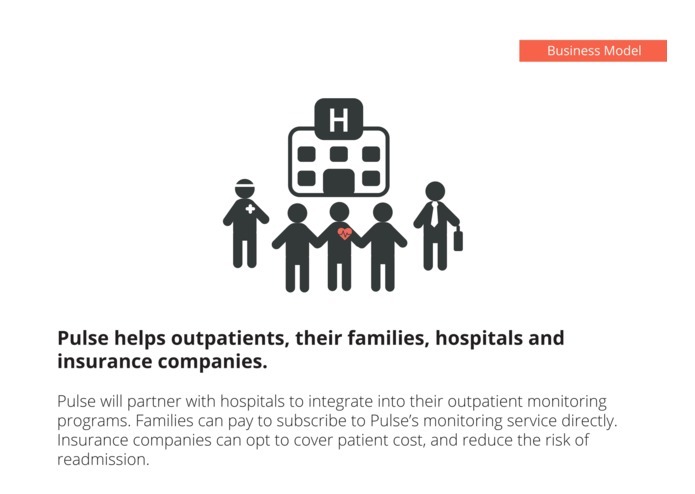 Users will invite family members and friends to monitor their health status and receive alerts. Data is collected passively while the user goes about their lifestyle. With the data, we can alert parties in case of health deterioration and allow for early intervention. The main challenge we encountered was with data. 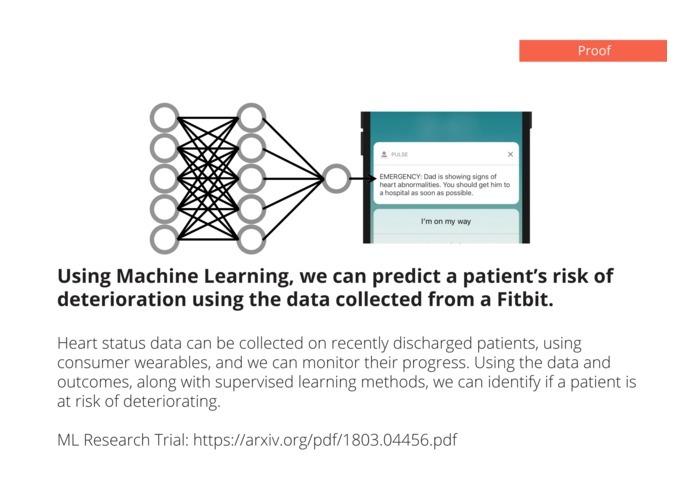 Overall, we need more data to implement our machine learning models. We only had one individual who was wearing a Fitbit to allow us to build the app. With regards to our goals, we would need to gather individuals who are recently discharged and monitor them. Also, the wearable we used, along with Fitbit APIs, are not the easiest to work with. Further, the data gathered isn't always within the acceptable range, thus we need more data to have confidence in our methods. In conclusion, we were only able to demonstrate possible features but the goal is still promising. We're proud of building the foundations of an app that helps people manage health risk and enjoy their life. With more work and help, we can make this app a reality. We learned to work with new technologies(e.g. 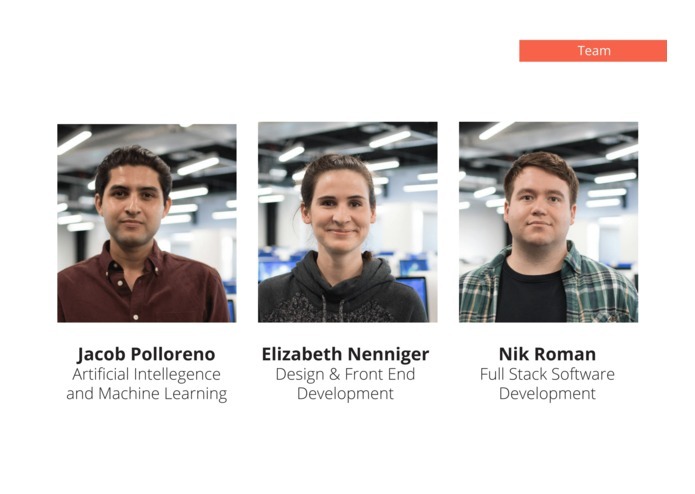 React Native and AWS) and gained more experience with building a product. We also learned more about heart failure and the risk involved with managing outpatient recovery. 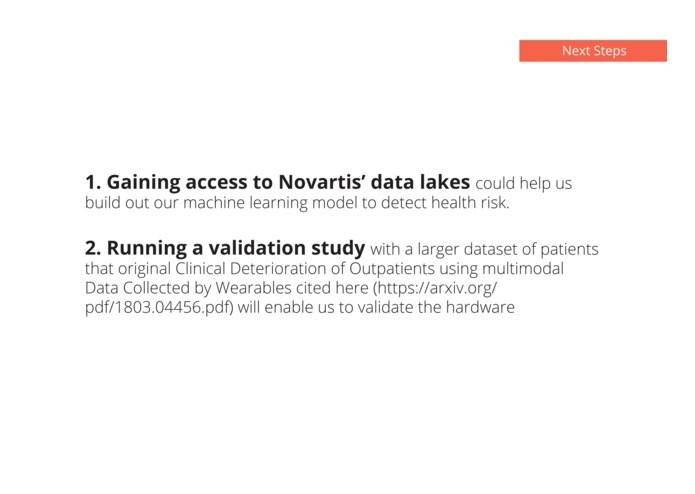 We are looking forward to seeing the results of the competition and looking forward to expanding the idea with Novartis. NOTE: All work done during hackathon period.